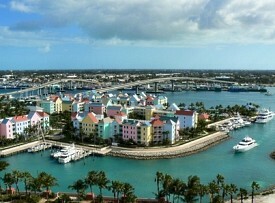 This capital city is a constant reminder of British influence in the Bahamas. Shoppers will want to hit the famous straw market, while those looking for some relaxation will find their place on the white-sand beaches of Paradise Island. Snorkeling and diving excursions and outings to Crystal Cay and Blue Lagoon Island also are popular. Ships dock just steps from downtown, making it easy to explore on foot.